IBM® Transaction Analysis Workbench for z/OS® is a tool for analyzing problems with the performance or behavior of transactions on IBM z/OS. You can analyze transaction logs in an ISPF-based log browser or in off-host analytics dashboards. Analyze records from multiple z/OS subsystems, including IBM CICS®, IBM Db2®, IBM IMS™, IBM MQ, SMF, IBM WebSphere® Application Server for z/OS and IBM z/OS Connect. Over 1,500 log record types. Include the logs and other historical data that each subsystem already generates during normal operation. No special agent software is required. Analyze different logs merged in time sequence, formatted with field labels and descriptions. No need to learn different tools for different logs. 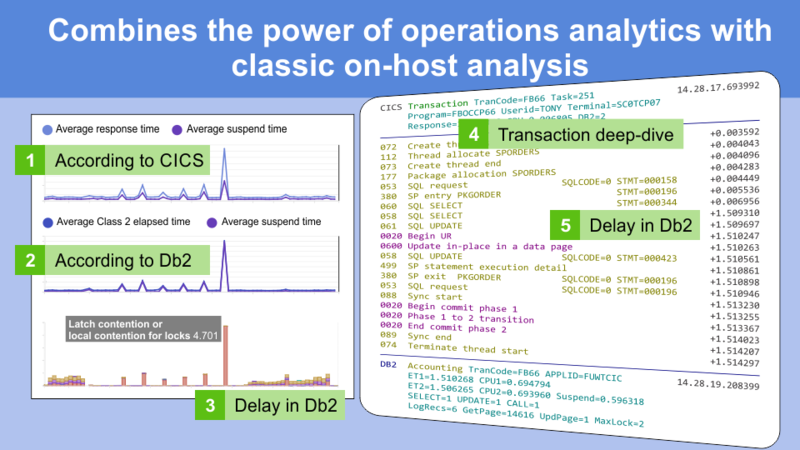 See all of the events in a heterogeneous transaction, for example CICS-Db2, CICS-DBCTL, IMS-Db2, in a single consolidated view. Use off-host analytics platforms to aggregate and visualize log data in dashboards. If you identify a problem, use the on-host ISPF log browser to perform more detailed, in-depth diagnosis. Save problem details and share them with other users. Tag records of interest and write notes. Keep a history of problem determination.